Luton boss Nathan Jones has revealed he is looking to ‘significantly’ improve his squad during the January transfer window. With clubs able to do business once more from Tuesday, January 1 until 11pm on Thursday, January 31, then the Town chief will be actively pursuing some new faces bolster his promotion chasing team. Speaking to the press this afternoon, he said: “We’re looking to improve the squad significantly, not with numbers, but just with quality. “So there could be one, there could be two, but we are actively looking to do that. “If we continue to do that every three, four month period, and then improve within ourselves within that period, then we’ll continue to move forward. “That’s what we’ve done since January 2016 as that’s all I can testify to, we have done that. “We were looking two and a half, three months ago at the players we want to bring in January. “We’re continually looking to improve things and it’s a constant ongoing thing. “All the time we’re actively looking and evaluating our own squad. "Who’s falling behind? Who’s not quite with us? Who’s maybe be the one that wouldn’t move forward with us? Or the ones that are really excelling and we’re thinking ‘yes’. 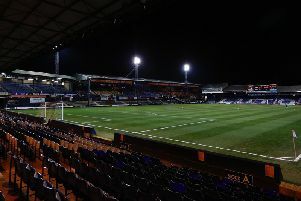 With the Hatters stunning recent form propelling them up to third in the League One table, just two points off the automatic promotion places, Jones admitted, he would only bring in players who could cope with life in the Championship, should Luton get there this term. He said: “We’re actually looking at players now that are out of our reach at the minute, that if we did get to the next level, then we would have them on our radar. “Anyone we bring in now, we’ll have one eye on not just to try and get us out of this league, we don’t recruit that way, because it goes against our processes. "So anyone we bring in, would have to be with an eye on doing very well at this level and being able to handle the other level. Meanwhile, when asked if Town’s lofty position had changed their shortlist of potential acquisitions, Jones added: “Not necessarily, what it might do is we become slightly appealing to other people, you never know. "If I was a player, and the way that the club is, not just the team, or the 11, or the manager, or the coaching staff, but the way the whole club is, it's a place where if I was serious about developing and being a top end footballer, it's a place I'd want to continue my development, 100 per cent."